Midwest Woodworkers is an outstanding store for hard wood and high quality woodworking equipment. 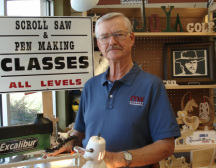 The store's owner, Gerry Phelan provides a wide variety of instructors that cover all areas of woodworking including carving, wood lathe, furniture construction and much more. I was privileged to have the opportunity to be an instructor for all of the Scroll Saw Workshops, and the Mini-Lathe Workshops that involve Pen Making, as well as Wine Bottle Stoppers for over 6 years. I am not teaching at Midwest Woodworkers any longer because of our move to Branson, Missouri this past summer. I highly recommend these classes that are still being taught at the store. Please link to Midwest Woodworkers to find out more class information and registration. Midwest Woodworkers is also the location you can check into the Excalibur Scroll Saws that I feature, and use, in my workshops and classes. Remember, any of you that took classes from me are always welcome to stop by my shop in Branson, and we will have a chance to catch-up. It would be great to see you again. (see the Branson Page & the map on the home page). 'In 2017 --Midwest Woodworkers' became part of the 'Woodcraft' store system in the U S.
IWCC is helping provide Continuing Education Classes that allows me to present Scroll Saw and Pen Making Workshops. have been presenting them on evenings and Saturdays since. I have had over 500 people complete these workshops in the Council Bluffs area. It is enjoyable for me to spend my senior years sharing these skills with those that want to learn them. Because of our move to Branson, Missouri I am no longer teaching at IWCC, but to any and all of you that participated in my classes there, please check the Map link on the home page and come see me if you would come to Branson on a vacation. It would be great to see you again.